INCHES ON FEBRUARY 22ND 1909 AND FEBRUARY 19TH 1953. FEBRUARY. THE OLD RECORD OF 14.1 INCHES OCCURRED BACK IN 1912. Denver climate history began in 1872. The average temperature for the first 3 days of February at Denver is 2.5° above normal. Since Denver generally has its heaviest late-season snows in March, this could be considered an early spring storm. Preliminary reports from the National Climatic Data Center show 27 daily snowfall records set on February 3, nearly all in Colorado. The overwhelming ratio of daily high temperature records to low temperature records has continued from January into the first 2 days of February. Preliminary reports from the National Climatic Data Center show 176 heat records broken in the first 2 days of the month, vs. 0 cold records in the lower 48 states, plus all of 2 in Alaska. You betcha', partial-term governor Sarah Palin, it really is cold in Alaska. January Ends With Incredible Ratio of [Update] 29 to 1 in Contiguous U.S.
Feb. 1, AM Update: The National Climatic Data Center reports an additional 123 new high temperature records on January 31 (vs. 0 cold records). This brings the ratio for the month to nearly 22 to 1 and the ratio for the lower 48 states to 29 to 1. The chart has been updated. New temperature records were set today, January 30th, 2012 across eastern Nebraska. Omaha's new record is 69 degrees, which breaks the previous record of 60 set in 1974. This also ties the all time high in January, which was reached January 25, 1944. In Lincoln, the new record high is 70, breaking the previous record of 60 set in 1931. And in Norfolk, the new record high is 67, breaking the previous record of 57 set in 1992. A very mild January 2012 is ending with more new high temperature records being set in the Mid Atlantic region and the Northeast. Washington Dulles has at least tied broken the daily record for January 31 with 66° (old record 65° in 1993). By mid afternoon, the 54° at Bridgeport CT exceeded the old record of 53° set in 1974. At Islip NY, where the climate history extends back only to 1986, the temperature of 52° before noon broke the old record of 51° set in 1988. The 63° at Georgetown DE exceeded by 3° the record of 60° in 1974. The 63° at Atlantic City NJ tied the record from 1988 in a climate history which began back in 1874. 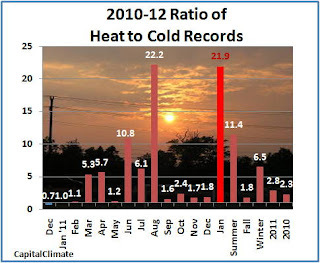 This is now the 13th consecutive month that new high temperature records have exceeded low temperature records in the U.S., since cold records eked out a ratio of 1.5 to 1 vs. heat records in December 2010. The preliminary reports from the National Climatic Data Center through January 30 show heat records crushing cold records by a ratio of 20.7 to 1, nearly as high as the incredible 22.2 to 1 last August. Without the 25% of total January cold records set in Alaska, the ratio for the contiguous 48 states is 27.5 to 1. With meteorological winter now two-thirds over, the ratio for the season as a whole is at 6.2 to 1.